We’ve recently put live a few changes around how places are stored in our database so we thought a blog post was in order to bring you up to date. We now treat places that we’ve pulled in from Foursquare and Facebook the same as other places in our database. 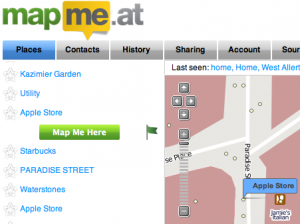 In the past you wouldn’t be able to favourite a location that came from Foursquare, but now you can! When we import a place from one of these services we have always looked in our database for any similar places and tried to match them up. Unfortunately if the name is entered slightly differently or the location has been recorded differently then it’s quite possible that we won’t be able to match it. This is why we’ve now added the ability for you to mark places as duplicates yourself. There’s two ways you can do this. If you’re accessing your main homepage through a regular browser then when you click on a location you will see the usual “Map Me Here” button but you will also see a new flag icon. If you tap on the flag we will confirm that you want to flag the duplicate and will then save that to the system. We review these reports regularly and will merge any duplicate places together. Don’t panic! If you’ve already checked into one or the other place we will update your old check-ins to point at the correct item. If you’re accessing our mobile site you will see a slightly different UI. Simply tap the button on the bottom of the screen, then tap on the place that is duplicated. If you tapped the button by accident just tap again and it’ll cancel. We hope these changes will make the site easier to use and will help you to enjoy the site, and your WhereDials!